He understood that through all of mans unfaithfulness we have God who is faithful from the time of Abraham to the faithfulness of God in Christ until his return. Just as God attributed righteousness to Abraham because he believed God’s promises, we also should not put our hope in anything we have done, but in him who is faithful. both. An easy way to understand and remember this is that to know the three ways he does this. 1. Past – God has saved us from something for something. 2. Present – God is saving us from something for something. 3. Future – God will save us from something for something. Our job is not to save people but to convince them they need to be converted. To help them realize there is a problem apart from Jesus and that we are not saved from hell but from God’s wrath. God’s wrath is upon man simply because we exchanged his Glory for things we can control and that we are worshiping things that we think can sustain us in life. Therefore, God’s anger is good for us because he doesn’t want us to go down a destructive path. the kingdom and he did it perfectly everyday of his life all the way to the cross and beyond. His rule is in complete contrast to that of the Romans or the institutions we have today. In Jesus’ perfect submission to the father we see the example of the above passage. It is only as we are in him in submission and dependency that we find truth and bear fruit. Jesus was the perfect man and therefore, the perfect example. He exemplified the perfect life before God, willingly and willfully submitted, dependent on God, even to the cross, becoming a substitute for wrath warranted by us, and then becoming our sin and death, that we might know the righteousness of God. sin and therefore, there is now no condemnation for those who are in Christ. Therefore, we don’t have to do anything in order to get right with God, but place our faith in Jesus as Abraham placed his faith in God. We don’t have to work harder, to cover our shame, to convince God we are serious this time about our sin problem. All we are asked is to do is repent. We don’t have to beat ourselves up we just boast in Christ. We must understand that our lives our now hidden in Christ and that God loves us. We no longer have to look to our own daddy for our approval, because God has said to Christ, “This is my son in who I am well pleased.” Therefore, everything God spoke to Jesus he has spoken to you who are hidden in him. It is no longer I who live, but it is Christ in me. This is exactly what Paul said to the Galatians. Understand that there is no work that can match what Christ has done. So for those who look for God to say to them, “Well done Good and faithful servant” that has already been spoken to you if your life is hidden in Christ. When it comes to sin, shame is the feeling we have when we replace our worship of Jesus with something else. We should never use the consequences of sin to help get people free from sin. It doesn’t work. Shame and consequences are just simply a reminder that all people are broken and if you live in that place you will never get free. else to define you instead of me? What God wants for us in our moments of brokenness is not for us to exalt in our sin, or cover our sin with fig leaves, or wallow in pity, or to beat ourselves up. He wants us to exalt in Christ because Jesus did what was sufficient and there is no need to either beat yourself up or work harder for his mercy. In Christ’s sufficiency, we hear him from the cross say, “Father forgive them they know not what they do!” He is still speaking this to us today. The great news is that God doesn’t look to us for forgiveness he looks to Christ’s sufficiency. God is satisfied with the work of Jesus but the question is, “Are you?” We have to believe it because there is nothing else. There is nothing more. It is all Jesus. Remember we are hidden in Christ and accepted as children of God’s gracious love in Christ. Therefore, our past sin, guilt, and shame is destroyed by the work of Christ and we can walk boldly before this world as his children. Jesus has saved us from the past. in what Christ accomplished on our behalf. You cannot separate what Jesus did on the cross and the reality of his love for you. If you do, you do not understand the Gospel correctly. Those two reality always exist together and to not feel that is probably a shallow understanding of the gospel, where you have viewed the gospel as a legal transaction. It is not just that in Christ we went from rebel to righteous, but also that we went from children of wrath into children of God. This is a relational good news and not just a legal good news. If you don’t believe that God came and died for your sins and purchased you as children of God because he loved the creation that went astray, then fundamental fruits of God character will be missing in your relationship with other people because there missing in you or you have suppressed that truth. There are many that do not feel God’s love who claim to be of him. There are also many we know who are really unlovable. In both cases the gospel of Jesus presents an opportunity for them to know that love and and to be transformed by it. The gospel changes hearts and emotions from one of not feeling love or being unlovable, to knowing Jesus and his truth concerning his love for them. That reality should form our hearts and should overflow from our hearts to the world around them. oppression, emotions, and beliefs they hold in those times. We who have a correct understanding of the gospel must let the correct understanding of God’s love outflow to those who are around us. We need to allow the good news of Jesus move them from what they believe in those moments and see the reality of God’s love. place of a lies and that of hiddeness before others and the Lord. When it comes to guilt and shame God doesn’t motivate mankind through our own actions but through the actions of Jesus and his work on the cross who takes on all guilt and shame in order to give life to his children. If we accept his reality as our motivation, then his love motivates us towards a intimate relationship with God. Our actions then become motivated be his love, rather then motivated by a lifestyle of one who seeks a life of never ending appeasement and hiddenness. from. Therefore, we must understand not the behavioral change that is repentance, but the worship change that is repentance. It changes my belief from a false God I believed in, into the true God as revealed in Christ and that leads to change. This gospel is something we stand in and stand upon. It not only saved us from our sins but it is saving us from sinning. It is the power by which we are being saved. V3-8 is Paul announcement of the historical reality of Jesus’ resurrection by which all faith and the power of the cross comes to life by giving us life in him. Resurrection is NOT you go to heaven when you die. Resurrection means you get a new body, and receive a new life after you die. The resurrection is the good news of receiving a new body in a new heaven and earth that you get to live on forever. In the next verses (12- 49) Paul addresses a debate in the Corinthian church concerning the resurrection. The resurrection he claims is so important that if Jesus did not raise from the dead he emphasizes we would all be lost in our sins still under the wrath of God with no hope for tomorrow. It would mean sin never was defeated and Jesus did not defeat the effects of sin, death. did conquer sin and resurrect, and if Jesus did receive his new body defeating death, and if Jesus has risen and taken his rightful place in the new heaven and new earth and is the victor in all these things. It is awesome news. The power of the overcoming king is that he rose from the dead and because of it we don’t just say thank God I am forgiven we can say thank God I am alive. Because he lives he has given us a helper his Holy Spirit in which we live and dwell and submit to as we walk out the life he has for us. So its not that we just say thank you I am forgiven,but thank you I am alive, as new creation, set free, with power to overcome and I don’t have to live by the addiction of sin. The new reality of the new resurrection has already happened and the spirit gives us a foretaste. It is almost like the movie “Back to the Future”. Doc comes back and tells Morty that his kids are in trouble. The future tell the present what the future is like. In that movie we know it wasn’t a good future, but in Christ he has shown us what the future holds as we abide in him. In Jesus we have that foretaste of that reality and Jesus, by his spirit, has brought that future reality to the present as assurance hope and a new reality to live now. The resurrection is about the future reality breaking into the current reality. Its about the new breaking into the old. It’s the future kingdom in the present and those who live by that reality acting as sign posts of the future kingdom in the new heaven and new earth. We, as ambassadors of Christ, carry the weight of the king and the reality of the kingdom now. It is why he would say we will do greater things than he did because we have the ability in him and through him to walk as he walks in the world we live now and bring the future reality now. Those who live by the spirit can announce the King in the room now because as the spirit breaks forth and overflows from him through you he enters the room. This is the power of the resurrected Christ in you. In fact it is wrong to ask some if they have received Jesus or made a decision for him. Instead, as verse 9 indicates, we are to ask if they have receive the Spirit of Christ who has raised from the dead. This represents the reality of Old Testament Temple upon where they would shed blood in the temple for sin and then the Spirit of God would enter in the temple once it was cleansed. This is what Paul is referring to here. The reality of one who is cleansed by the work of Jesus on the cross and thereby has received his spirit through faith. If they do not have the spirit and the fruit of that change then we should be concerned. Here is where we should see the importance of this as we bring it together. In John 20: 22 Jesus breathed on the them and gave them the Holy Spirit. As he sent them he sent them in the same way he came to them by the power of the Spirit. Jesus did not do ministry in his own power but rather in submission to the power of the Holy Spirit. work of God without the Spirit of God. mind, soul, and to draw us close to others bringing the light of Christ to others. One day we had a party at the house and some people from the community had brought alcohol to the party. However, I noticed when Tim came he wasn’t drinking any more. So I took him aside and I asked him what the deal was. Tim began to tell me that he had embarrassed God, himself, and his family and felt like he should stop drinking because he felt convicted and wanted to please God. I was so overwhelmed and smiled as he told me this story. The Spirit of God had convicted him unto righteousness and he did it without my help. I learned a lot that day. That we are to walk in the light of God’s love, that God’s kingdom is still breaking into our world, and Jesus is still getting victory over sin. I am so thankful I am not the Holy Spirit and so grateful for the power of salvation now! We have to learn to allow the Holy Spirit to do what he does and then point it out later and show people, like Tim, that this is what God does. He brings us to the correct path as we walk out Gods’ truth with Jesus. Just like the passage in Luke 4, we like Jesus need a dependency on the Holy Spirit in our walk. Think about what they are saying. For thirty years Jesus lived among them and never seemed different and nobody hardly notices him. Then as the Spirit of God descends on Jesus and he begins to preach they become marveled and ask who is this? Here is what we need to understand. That many times in the church we see Pastors who have great gifting in teaching and we default to their gifting. However, in the process we create an attitude and culture, which is prevalent in the church today that says, “God could never use me.” We have this tendency or attitude sometimes that the Spirit of God can break through in someone else’s life and do great things and anoint them, but few of us believe that he could do that in our own lives and so we have not fully trusted and embraced what God wants to do through you. Remember, its what God will do through you and not in your wisdom and strength, but by His Spirit. man, woman, slave, free, boy, girl, man and woman took on the the same position as Jesus being submissive to the Holy Spirit allowing them to proclaim the works of God, not in their own might but by the power of the Spirit. This is evident as Peter, who had just recently denied Christ is prompted and began speaking by the power of the Spirit. He proclaims the truth and reality of Jesus to the surrounding people who witnessed this outpouring. This is the point of who we are in Christ. We are people who don’t give into temptation because we live by the Spirit. Gospel to each other and to the world around us. Imagine if we did this everyday if people would see the reality of God and the heart of God in and through his people. and discerning of the Holy Spirit. This same Spirit is for all and in all that are called sons and daughters of Christ. we have to ask when someone says, “How come we don’t experience the power of God?”, is do you even need it for the life your living. If you want a life that you can control, that you can predict, that you can run that is the life of the flesh and of the the world. If you want a life of the Spirit then that is a life like Abraham, who was simply told to go as God leads him to land you don’t know. In the kingdom of God you don’t know where you are going you just know who is taking you there and you have power by the Spirit of God! If we do not believe this then we have to ask what are we doing. then handed off the impossible to the disciples and Paul, who made disciples of the impossible. We are a people of the impossible but not a people of our own strength. It is not our might, it is not strength, it is by the Spirit of The Lord. The Gospel isn’t something that happened, it is something that is happening in you and me right now. God is still saving us and empowering us through the Spirit. The Gospel isn’t that God has saved, and is saving us, but that he will save us into the eternal presence of our King, Jesus. Blessed be the God and Father of our Lord Jesus Christ! According to his great mercy, he has caused us to be born again to a living hope through the resurrection of Jesus Christ from the dead, to an inheritance that is imperishable, undefiled, and unfading, kept in heaven for you, who by God's power are being guarded through faith for a salvation ready to be revealed in the last time. In this you rejoice, though now for a little while, if necessary, you have been grieved by various trials, so that the tested genuineness of your faith--more precious than gold that perishes though it is tested by fire--may be found to result in praise and glory and honor at the revelation of Jesus Christ. sake of the Gospel. 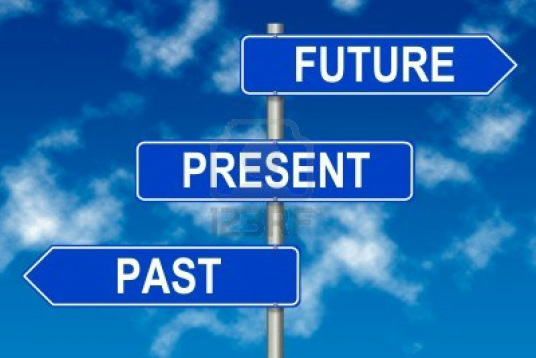 The Gospel encompasses our past, our present, our future. There will really be a day where there will no more suffering, no more tears, no more pain, no sin, satan, no more brokenness and no more death. God and shout thanksgivings to The Lord. The momentary trials are nothing compared to the glory that is coming to Gods people, who cannot in any literary terms begin to describe what God has in store. This should be in front of us and others in our proclamation of the Gospel. If we don’t understand the gospel in terms of the past, present, future then wewill never proclaim it. Talking about Jesus and proclamation is not a matter of technique or evangelism classes. It is a matter of being in love. I remember when I met my wife every time I was around my friends all I did as talk to about her. It didn’t matter where we were or what we were doing I talked about her because I was in total love. It was so bad my friends would often yell at me to shut up. In the same way if we are in love with Jesus we don’t have to DO a technique in order to speak of him. the Good news of Jesus to the world.